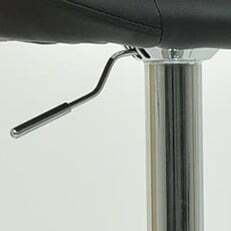 Using a gas lift mechanism, you can vary the height of the seat by as much as 20cm, and you can swivel round in a full circle. The under section is all finished in shining chrome and includes a useful footrest connected to the central column. Underneath the circular base is a floor protector. Eclipse Bar Stool Dark Grey.